At Year 7 level, students explore the kitchen and understand how to use equipment safely. They start to form the foundations different culinary principals and put into place theoretical and practical scenarios. Students use ICT to create informative projects and research different recipes. They work in teams and individually to create food and practise their skills for a range of contexts. Within Year 8 Food Technology, there is a strong focus on creativity and overall simplicity in cooking practicals. As a faculty, we endeavour to increase food literacy through highly engaging theory lessons that are designed to empower students with practical knowledge about a well-balanced diet, key nutrients in fruits, vegetables and a variety of meats. Our practical classes are exciting learning environments where teachers focus on experiential knowledge and develop key skills including, wet and dry cooking methods, knife skills, perfection of safety and hygiene skills and presentation techniques. Students in Year 9 World of Food learn about the Aboriginal cuisine and its range of cooking styles, early influences on Australian food from the First Fleet to the food trends we have in Australia today and different types of cuisines around the world. To complement this learning, students create food products from different countries each week which focus on the different cooking techniques and ingredients used in the particular cuisine. Some of the practicals include spring rolls, sushi, tandoori chicken, and gnocchi with tomato and basil sauce. Students complete a ‘Design Process’ for their major assessment task where they investigate a country of their choice and design a dish which fuses elements from their chosen cuisine and either Aboriginal or Asian inspired dishes. This includes research, design, production and evaluation. After each practical session the students are expected to do some self- evaluation and sensory responses. 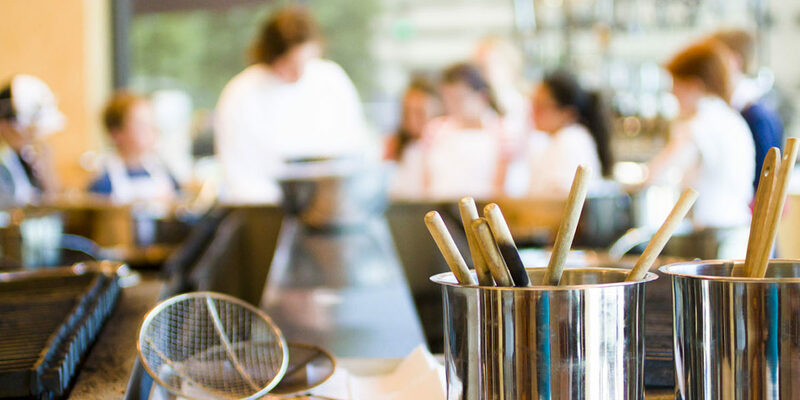 This course aims to help students get a taste for the hospitality industry, while at the same time they learn about the fundamentals of commercial cookery within the industry. The course gives students a ‘hands on’ approach to different cooking methods, they include stocks, soups, pasta and risotto making and other cuisines based on different styles from around the world and trends in society within the food we eat today. Students complete an assignment on designing their own restaurant. This interdisciplinary based assignment covers all the fundamental aspects of starting a restaurant from the beginning. The topics include menu design, recipe costing, business strategies and the practical element of creating their own food. This encourages them to challenge key knowledge and try new, innovative recipes. Year 11 Food Technology concentrates on building students technical knowledge of food properties, food groupings, food related illnesses, innovation in tools and equipment, cereals, dairy products, fats and oils and the list goes on and on. Students will then turn this knowledge into practice within our well equipped kitchens. Students are encouraged to maintain a strong focus on presentation techniques, and with the guidance of two qualified chefs students are always pushed to their limits in applying their newly acquired skills. At the Year 12 level of Food and Technology, students cook new and exciting cultural diverse foods and put their prior learning into practice. They incorporate the use of advanced and modernised equipment to produce innovative food products. The students work on a folio with a previously developed design brief in order to create food for a particular scenario. They work with different cooking and processing techniques safely and hygienically, as well as preserving food items in many different ways. Students learn about the different sensory, chemical and physical properties of food so that they are able to manipulate the ingredients in a range of recipes. They put their culinary skills into action by designing and creating fun and exciting foods from a previously developed design brief.